A seriously stunning homestay near Mumbai awaits you for a vacation that is no less than going to Greece and back. 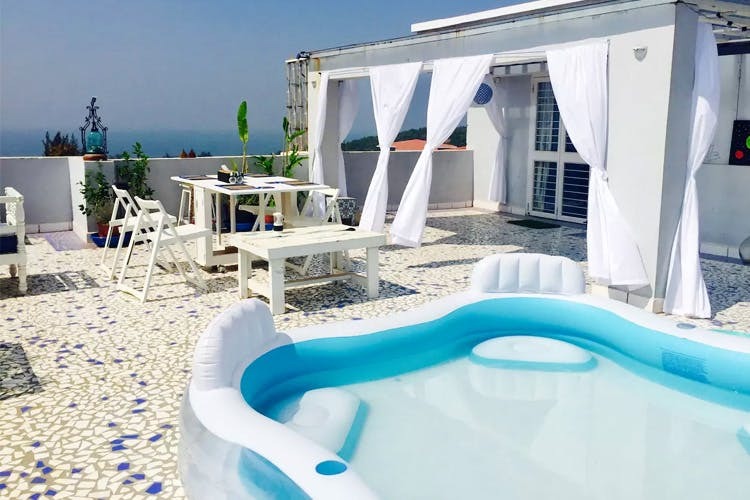 This is a Mediterranean setup rooftop apartment, where the theme of the hour is speckled tile flooring, pristine white wooden chairs and a vista of the Ganpatiphule beach to go with. The hosts, Niyoti and Vinay, as per visitors are wonderful and thoughtful, and even provide beach tents, an Ipod dock, a bicycle, a djembe drum, and a ton of other things to just entertain yourself with including board games. You could take a train from Mumbai to Ratnagiri, from there you will have to take a cab to get to the location. Keep in mind that the house is not in the hub of commercial activity and is a little secluded. Keep food supplies ready. We found the booking listed on Airbnb, where one night’s stay is INR 5,998 and booking for two nights is compulsory. Go to splurge, with the family or with your SO and feel the wind in your hair from when you’re having dinner on the terrace, near the bonfire. Make your booking now from here.